REAFFIRMING ADHERENCE Lo the principles of the rights and welfare of the child contained in the declaration, conventions and other instruments of the Organization of African Unity and in the United Nations and in particular the United Nations Convention on the Rights of the Child; and the OAU Heads of State and Government’s Declaration on the Rights and Welfare of the African Child. 1. Member States of the Organization of African Unity Parties to the present Charter shall recognize the rights, freedoms and duties enshrined in this Charter and shall undertake to the necessary steps, in accordance with their Constitutional processes and with the provisions of the present Charter, to adopt such legislative or other measures as may be necessary to give effect to the provisions of this Charter. 2. Nothing in this Charter shall affect any provisions that are more conductive to the realization of the rights and welfare of the child contained in the law of a State Party or in any other international Convention or agreement in force in that State. 3. Any custom, tradition, cultural or religious practice that is inconsistent with the rights, duties and obligations contained in the present Charter shall to the extent of such inconsistency be discouraged. For tile purposes of this Charter, a child means every human being below the age of 18 years. 1. In all actions concerning the child undertaken by any person or authority the best interests of the child shall be the primary consideration. 2. In all judicial or administrative proceedings affecting a child who is capable of communicating his/her own views, and opportunity shall be provided for the views of the child to be heard either directly or through an impartial representative as a party to the proceedings, and those views shall be taken into consideration by the relevant authority in accordance with the provisions of appropriate law. 1. Every child shall have the right from his birth no a name. 1. Every child shall have the right to freedom of thought conscience and religion. 2. Parents and, where applicable, legal guardians shall have a duty to provide guidance and direction in the exercise of these rights having regard to the evolving capacities, and best interests of the child. 3. States Parties shall respect the duty of parents and where applicable, legal guardians to provide guidance and direction in the enjoyment of these rights subject to the national laws and policies. 1. Every child shall have the right to an education. (h) the promotion of the child’s understanding of primary health care. (e) take special measures in respect of female, gifted and disadvantaged children, to ensure equal access to education for all sections of the community. 4. States Parties to the present Charter shall respect the rights and duties of parents, and where applicable, of legal guardians to choose for their children’s schools, other than those established by public authorities, which conform to such minimum standards may be approved by the State, to ensure the religious and moral education of the child in a manner with the evolving capacities of the child. 5. States Parties to the present Charter shall take all appropriate measures to ensure that a child who is subjected to schools or parental discipline shall be treated with humanity and with respect for the inherent dignity of the child and in conformity with the present Charter. 6. States Parties to the present Charter shall have all appropriate measures to ensure that children who become pregnant before completing their education shall have an opportunity to continue with their education on the basis of their individual ability. 7. No part of this Article shall be construed as to interfere with the liberty of individuals and bodies to establish and direct educational institutions subject to the observance of the principles set out in paragraph I of this Article and the requirement teal the education given in such institutions shall conform to such minimum standards as may be laid down by the States. 1. Every child who is mentally or physically disabled shall have the right to special measures of protection in keeping with his physical and moral needs and under conditions which ensure his dignity, promote his self-reliance and active participation in the community. 2. States Parties to the present Charter shall ensure, subject to available resources, to a disabled child and to those responsible for his care, of assistance for which application is made and which is appropriate to the child’s condition and in particular shall ensure that the disabled child has effective access to training, preparation for employment and recreation opportunities in a manner conducive to the child achieving the fullest possible social integration, individual development and his cultural and moral development. 3. The States Parties to the present Charter shall use their available resources with a view to achieving progressively the full convenience of the mentally and physically disabled person to movement and access to public highway buildings and other places to which the disabled may legitimately want to have access to. 1. Every child shall have the right to enjoy the best attainable state of physical, mental and spiritual health. 1. Every child shall be protected from all forms of economic exploitation and from performing any work that is likely to be hazardous or to interfere with the child’s physical, mental, spiritual, moral, or social development. (d) promote the dissemination of information on the hazards of child labour to all sectors of the community. 1. States Parties to the present Charter shall take specific legislative, administrative, social and educational measures to protect the child from all forms of torture, inhuman or degrading treatment and especially physical or mental injury or abuse, neglect or maltreatment including sexual abuse, while in the care of the child. (d) prohibit the press and the public from trial. 3. The essential aim of treatment of every child during the trial and also if found guilty of infringing the penal law shall be his or her reformation, re-integration into his or her family and social rehabilitation. 1. The family shall be the natural unit and basis of society. it shall enjoy the protection and support of the State for its establishment and development. 2. States Parties to the present Charter shall take appropriate steps to ensure equality of rights and responsibilities of spouses with regard to children during marriage and in the even of its dissolution. In case of the dissolution, provision shall be made for the necessary protection of the child. 3. No child shall be deprived of maintenance by reference to the parents’ marital status. 1. Every child shall be entitled to the enjoyment of parental care and protection and shall, whenever possible, have the right to reside with his or her parents. No child shall be separated from his parents against his will, except when a judicial authority determines in accordance with the appropriate law, that such separation is in the best interest of the child. 2. Every child who is separated from one or both parents shall have the right to maintain personal relations and direct contact with both parents on a regular basis. 3. Where separation results from the action of a State Party, the State Party shall provide the child, or if appropriate, another member of the family with essential information concerning the whereabouts of the absent member or members of the family. States Parties shall also ensure that the submission of such a request shall not entail any adverse consequences for the person or persons in whose respect it is made. 4. Where a child is apprehended by a State Party, his parents or guardians shall, as soon as possible, be notified of such apprehension by that State Party. (c) to ensure that domestic discipline is administered with humanity and in a manner consistent with the inherent dignity of the child. (c) to ensure that the children of working parents are provided with care services and facilities. 2. Child marriage and the betrothal of girls and boys shall be prohibited and effective action, including legislation, shall be taken to specify the minimum age of marriage to be 18 years and make registration of all marriages in an official registry compulsory. 1. States Parties to this Charter shall undertake to respect and ensure respect for rules of international humanitarian law applicable in armed conflicts which affect the child. 2. States Parties to the present Charter shall take all necessary measures to ensure that no child shall take a direct part in hostilities and refrain in particular, from recruiting any child. 3. States Parties to the present Charter shall, in accordance with their obligations under international humanitarian law, protect the civilian population in armed conflicts and shall take all feasible measures to ensure the protection and care of children who are affected by armed conflicts. Such rules shall also apply to children in situations of internal armed conflicts, tension and strife. 4. The provisions of this Article apply mutatis mutandis to internally displaced children whether through natural disaster, internal armed conflicts, civil strife, breakdown of economic and social order or howsoever caused. (f) establish a machinery to monitor the well-being of the adopted child. (b) shall take all necessary measures to trace and re-unite children with parents or relatives where separation is caused by internal and external displacement arising from armed conflicts or natural disasters. 3. When considering alternative family care of the child and the best interests of the child, due regard shall be paid to the desirability of continuity in a child’s up- bringing and to the child’s ethnic, religious or linguistic background. 1. States Parties to the present Charter shall individually and collectively undertake to accord the highest priority to the special needs of children living under Apartheid and in States subject to military destabilization by the Apartheid regime. 2. States Parties to the present Charter shall individually and collectively undertake to accord the highest priority to the special needs of children living under regimes practising racial, ethnic. religious or other forms of discrimination as well as in States subject to military destabilization. 3. States Parties shall undertake to provide whenever possible, material assistance to such children and to direct their efforts towards the elimination of all forms of discrimination and Apartheid on the African Continent. (c) the use of children in pornographic activities, performances and materials. States Parties to the present Charter shall take all appropriate measures to protect the child from the use of narcotics and illicit use of psychotropic substances as defined in the relevant international treaties, and to prevent the use of children in the production and trafficking of such substances. (b) the use of children in all forms of begging. (f) the essential aim of the penitentiary system will be the reformation, the integration of the mother to the family and social rehabilitation. (f) to contribute to the best of his abilities, at all times and at all levels, to the promotion and achievement of African Unity. 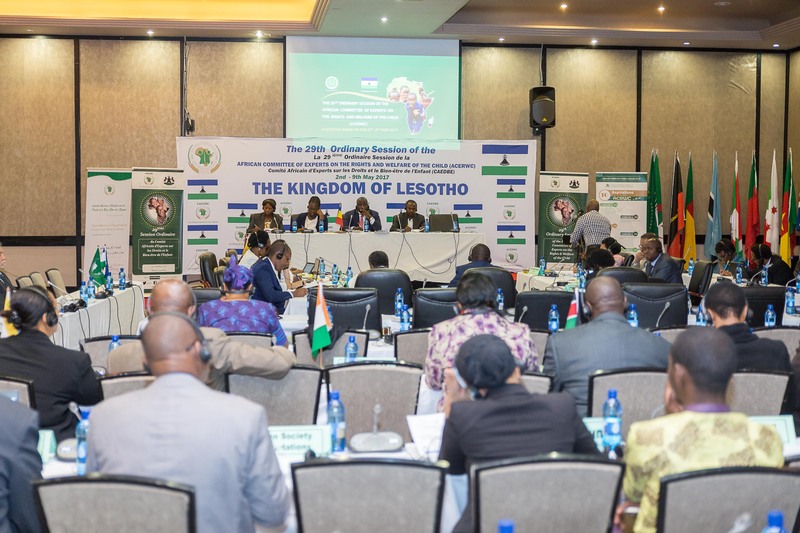 An African Committee of Experts on the Rights and Welfare of the Child hereinafter called `the Committee’ shall be established within the Organization of African Unity to promote and protect the rights and welfare of the child. 1. The Committee shall consist of 11 members of high moral standing, integrity, impartiality and competence in matters of the rights and welfare of the child. 2. The members of the Committee shall serve in their personal capacity. 3. The Committee shall not include more than one national of the same State. As soon as this Charter shall enter into force the members of the Committee shall be elected by secret ballot by the Assembly of Heads of State and Government from a list of persons nominated by the States Parties to the present Charter. Each State Party to the present Charter may nominate not more than two candidates. The candidates must have one of the nationalities of the States Parties to the present Charter. When two candidates are nominated by a State, one of them shall not be a national of that State. 1. The Secretary-General of the Organization of African Unity shall invite States Parties to the present Charter to nominate candidates at least six months before the elections. 2. The Secretary-General of the Organization of African Unity shall draw up in alphabetical order, a list of persons nominated and communicate it to the Heads of State and Government at least two months before the elections. 1. The members of the Committee shall be elected for a tenn of five years and may not be re-elected, however. the term of four of the members elected at the first election shall expire after two years and the term of six others, after four years. 2. Immediately after the first election, the Chairman of the Assembly of Heads of State and Government of the Organization of African Unity shall draw lots to determine the names of those members referred to in sub-paragraph 1 of this Article. 3. The Secretary-General of the Organization of African Unity shall convene the first meeting of Committee at the Headquarters of the Organization within six months of the election of the members of the Committee, and thereafter the Committee shall be convened by its Chairman whenever necessary, at least once a year. 1. The Committee shall establish its own Rules of Procedure. 2. The Committee shall elect its officers for a period of two years. 3. Seven Committee members shall form the quorum. 5. The working languages of the Committee shall be the official languages of the OAU. If a member of the Committee vacates his office for any reason other than the nonmal expiration of a term, the State which nominated that member shall appoint another member from among its nationals to serve for the remainder of the term – subject to the approval of the Assembly. In discharging their duties, members of the Committee shall enjoy the privileges and immunities provided for in the General Convention on the Privileges and Immunities of the Organization of African Unity. (iii)cooperate with other African, international and regional Institutions and organizations concerned with the promotion and protection of the rights and welfare of the child. (b) To monitor the implementation and ensure protection of the rights enshrined in this Charter. (c) To interpret the provisions of the present Charter at the request of a State Party, an Institution of the Organization of African Unity or any other person or Institution recognized by the Organization of African Unity, or any State Party. (d) Perform such other task as may be entrusted to it by the Assembly of Heads of State and Government, Secretary-General of the OAU and any other organs of the OAU or the United Nations. (b) and thereafter, every three years. (b) shall indicate factors and difficulties, if any, affecting the fullfilment of the obligations contained in the Charter. 3. A State Party which has submitted a comprehensive first report to the Committee need not, in its subsequent reports submitted in accordance with paragraph I (a) of this Article, repeat the basic information previously provided. 1. 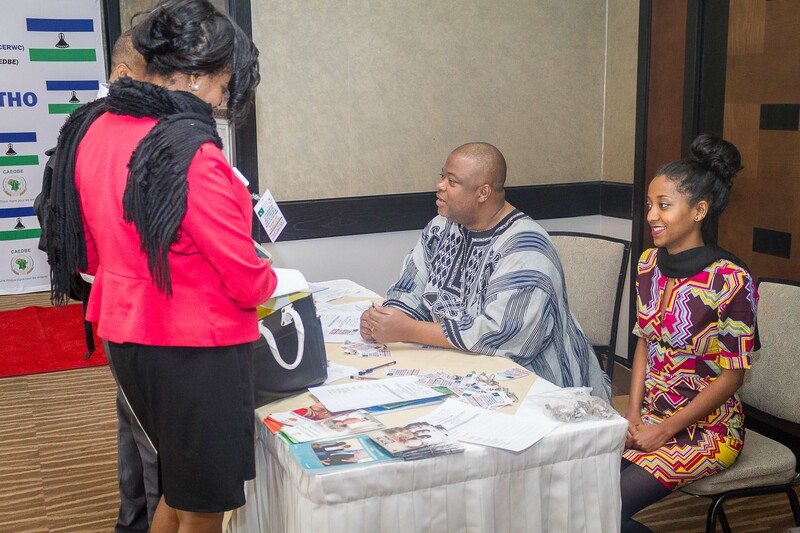 The Committee may receive communication, from any person, group or non- governmental organization recognized by the Organization of African Unity, by a Member State, or the United Nations relating to any matter covered by this Charter. 2. Every communication to the Committee shall contain the name and address of the author and shall be treated in confidence. 1. The Committee may, resort to any appropriate method of investigating any matter falling within the ambit of the present Charter, request from the States Parties any information relevant to the implementation of the Charter and may also resort to any appropriate method of investigating the measures the State Party has adopted to implement the Charter. 2. The Committee shall submit to each Ordinary Session of the Assembly of Heads of State and Govenrment every two years, a report on its activities and on any communication made under Article  of this Charter. 3. The Committee shall publish its report after it has been considered by the Assembly of Heads of State and Government. 4. States Parties shall make the Committee’s reports widely available to the public in their own countries. 1. The present Charter shall be open to signature by all the Member States of the Organization of African Unity. 2. The present Charter shall be subject to ratification or adherence by Member States of the Organization of African Unity. The instruments of ratification or adherence to the present Charter shall be deposited with the Secretary-General of the Organization of African Unity. 3. The present Charter shall come into force 30 days after the reception by the Secretary-General of the Organization of African Unity of the instruments of ratification or adherence of 15 Member States of the Organization of African Unity. 1. The present Charter may be amended or revised if any State Party makes a written request to that effect to the Secretary-General of the Organization of African Unity, provided that the proposed amendment is not submitted to the Assembly of Heads of State and Government for consideration until all the States Parties have been duly notified of it and the Committee has given its opinion on the amendment. 2. An amendment shall be approved by a simple majority of the States Parties. The members of the Committee shall be elected for a term of five years and may be re-elected only once. However, the term of four of the members elected at the first election shall expire after two years and the term of six others, after four years. The amendment entered into force upon its adoption.